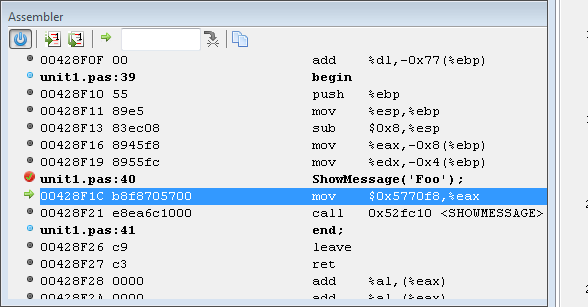 Shows an assembler view of the current code. This can be used with the Registers window. If pascal sources are available, then they are shown in front of their asm representation. The vertical scrollbar behaves different from normal scrollbars. Since the assembly data may continue to an unknown extend in both directions, there is no fixed range. Move and hold the slider in either direction to scroll. The further you move the slider from the center position the faster the scroll. If released the slider returns to the center. Switch of the disassembler. The current disassembled data is kept as it. If the current location changes, it will be indicated only within the data. Single step (into) one asm instructions, instead of on entire pascal instructions. Will enter subroutines. Single step (over )one asm instructions, instead of on entire pascal instructions. Will skip over subroutines. Returns to the current execution-point. Shows the data at the address entered in the input field. Copies the selected line(s) to the clipboard. Those keys will act, independent of the focused window. Those will step asm only if the assembler window is focused, and step pascal otherwise. The key mapping can be changed, for the unmodified F7/F8 to act on context. The debugger will disassemble the required memory range after each step, or each run. This may require some time. During single stepping the next execution point often is in already disassembled data. If you code is not self-modifying, then you can use the power button to disable the repeated disassembling. Once you stepped to the border of the disassembled range, you need to turn power on to allow disassembling the next block of data. Once you have the next block of data turn it off again. And so on. The assembler window does not follow any scope. The Stack window (context menu) allows to jump to the address of any stackframe. This acts like jumping to a custom address, the button will always return to the execution point at the top stack frame. This page was last modified on 1 July 2015, at 15:29.